From modest beginnings as a manufacturer of coal burning equipment, McBurney has developed into a full service organization providing engineering, construction and maintenance services to the industrial steam and power plant industries. McBurney was founded in 1911 as a manufacturer of coal stoker equipment and a representative of several power plant equipment suppliers. 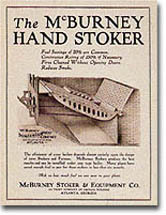 The McBurney Inclined Grate Coal Stoker was developed by Willard B. McBurney Sr. who was dedicated to developing innovative solutions for the efficient combustion of coal in commercial and industrial boilers. During the post World War I era, the McBurney underfeed stoker was introduced. 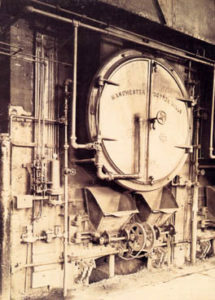 McBurney soon became a well known single source supplier for complete steam plants including boiler, stoker, feedwater systems, controls, and fuel handling equipment which were sold to textile mills, railroad shops and other manufacturers. During World War II, McBurney provided many small steam plants for Army and Navy bases. After the war, a market developed for new stoker designs that would burn fuel cleanly and more efficiently. McBurney engineers responded to the challenge and earned the company the reputation for developing clean combustion technology for various fuels including wood wastes. In the 1960s, McBurney grew and diversified as many forest products companies expanded wood products production. During this period, McBurney positioned itself as a leading design/construction firm specializing in biomass combustion. As the technological requirements for industrial steam generation continued to increase, larger boiler applications required the use of sophisticated combustion technologies and versatile fuel delivery systems. Our non-traditional fuel firing experience is impressive and includes wood waste, peanut hulls, coffee grounds, rice husks, bagasse, coconut hulls, chicken litter, waste paper, shredded tires, plastics, cardboard, municipal refuse, industrial sludges and waste gases. Today, McBurney has evolved into a firm providing comprehensive engineering, construction and maintenance services in all facets of steam and power plant projects. With over three generations of experience, McBurney understands the needs of its clients. We remain committed to meeting today’s demand for developing cost effective energy and environmental solutions.